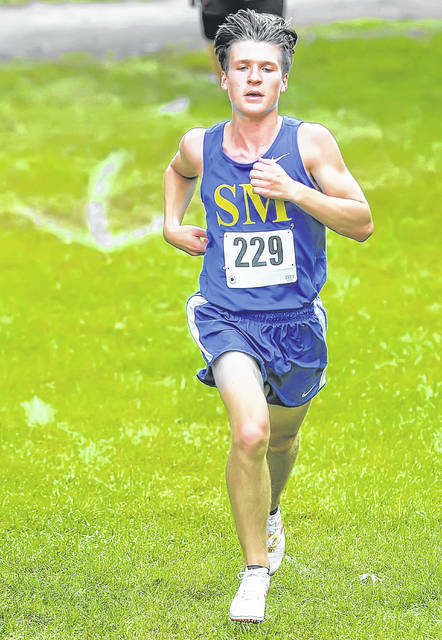 St. Marys’ Noah Tobin competes in Saturday’s Ottawa-Glandorf Blue/Gold Invitational at Ottawa Memorial Park. 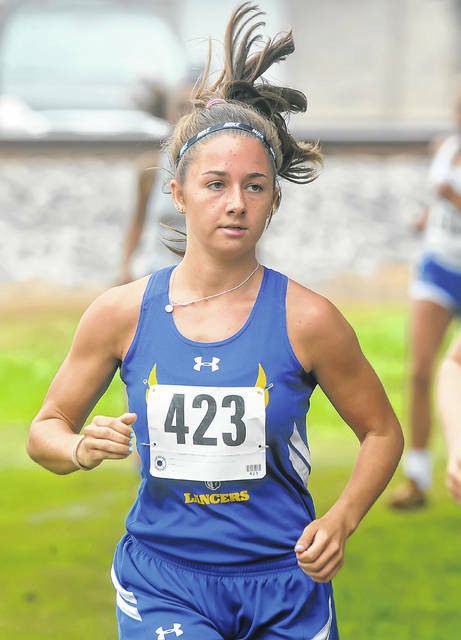 Lincolnview’s Madison Langdon competes in Saturday’s Ottawa-Glandorf Blue/Gold Invitational at Ottawa Memorial Park. 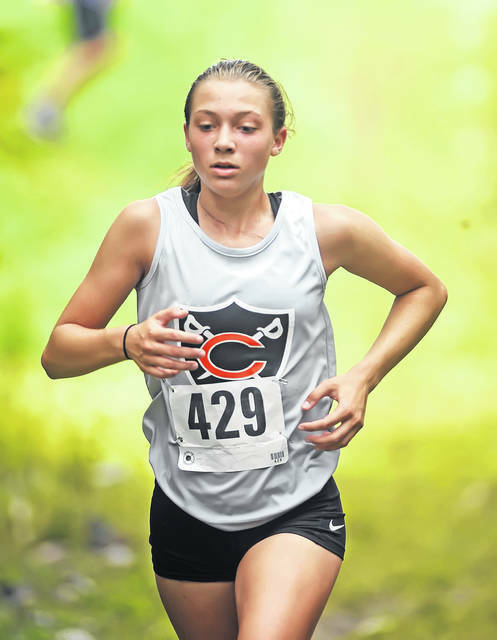 Coldwater’s Haley Alig competes in Saturday’s Ottawa-Glandorf Blue/Gold Invitational at Ottawa Memorial Park. 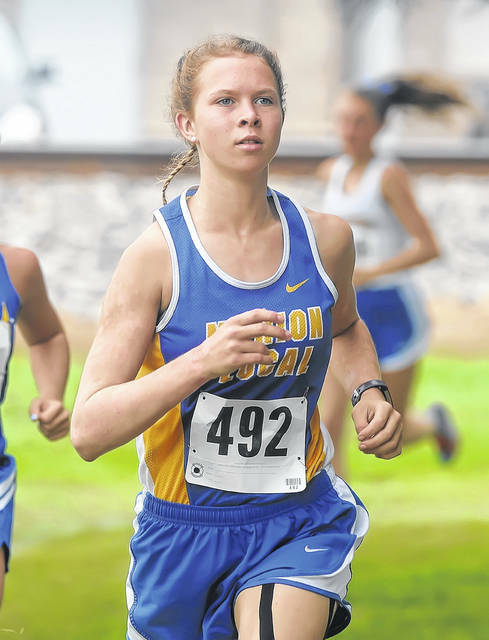 Marion Local’s Kelsey Broering competes in Saturday’s Ottawa-Glandorf Blue/Gold Invitational at Ottawa Memorial Park. OTTAWA — After winning the Elida Invitational this past Tuesday, the Lincolnview boys’ cross country team was heading into Saturday’s Ottawa-Glandorf Blue/Gold Invitational with some tired, heavy legs. However, once the starting gun went off Saturday morning, Lincolnview’s determination out-weighed its tired legs, as the Lancers went on to win the boys’ Gold Division (small school division) defeating second-place Edgerton 50-92. Holgate (95) finished third, while Stryker (110) and Ayersville (196) rounded out the top five teams in the 14-team field at Ottawa Memorial Park. “Actually, we ran better at Elida, I thought — in beating Columbus Grove,” Lincolnview coach Matt Langdon said. “We did OK today. We had some good things happen. Our No. 5 and No. 6 guys ran well again, which was good. Overall, I thought we did well. Times were a little slow, but it might have been for everybody. At Tuesday’s Elida Invitational, the Lincolnview boys’ team defeated Columbus Grove 28-38. Alek Bowersock led Lincolnview on Saturday with a second-place finish in a time of 17 minutes, 6.8 seconds on the 5,000-meter course. Teammate Karter Tow was a close fourth (17:12.9). Rounding out the top five runners for the Lancers were Devon Bill (12th, 18:13), Jacob Keysor (16th, 18:31.5) and Daegan Hatfield (20th, 18:41.7). Ayersville’s Noah Fisher won Saturday’s Gold Division race in 16:10.2. Perry freshman Braden Yingst finished third (17:06.9). Fisher was a state-placer in the Division III state cross country meet the past two seasons. Fisher said it felt different this year, with not having former Ottoville standout Brendan Siefker out there to key on. In the girls’ Gold Division, Delphos St. John’s took home the gold, defeating second-place Lincolnview 57-64. Leading St. John’s was freshman Addy Martin (10th, 21:19.1). Rounding out the top five runners for St. John’s were Kambrynn Rohr (11th, 21:46.2), Jenia Freewalt (12th, 21:51.9), Catherine Kopack (17th, 22:23.8) and Rylee Pohlman (21st, 22:56.9). “We had some things going on, when we got started here,” St. John’s coach Steve Hellman said. “Actually, my No. 1 girl didn’t join the team until the middle of July. She’s just a freshman and never ran before. She really pulled us along today. It was nice to get her out there, near the pack out front. That really helps with the team scoring. In the boys’ Blue Division (big school division), Wauseon notched the team title, defeating second-place St. Marys 91-135. Napoleon (145) finished third, while Fairview (150) and Ottawa-Glandorf (151) comprised the top five teams in the 17-team field. Napoleon’s Daniel Gaffney won the Blue Division race in 17:13.7. St. Marys’ Noah Tobin was the first area runner to finish. Tobin came in sixth (17:29.4). In the girls’ Blue Division, Coldwater slipped past Napoleon for the team title 56-77. Archbold (100) finished third, while Kenton (141) and St. Henry (145) rounded out the top five teams in the 14-team field. This entry was tagged delphosstjohns, lincolnview. Bookmark the permalink.